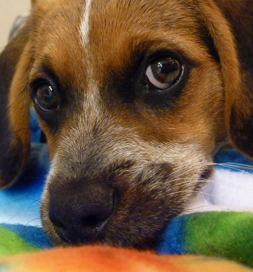 Penny, a Beagle mix has had several close calls. The first one came just after she was born. Her mother had stomped on the litter, resulting in the deaths of most of the puppies, but luckily, Penny had survived. When she was three months old, Cuddly Canines Rescue in La Habra, CA, listed her on Petfinder. Read Penny’s story in Shay’s words. Then they had a rude awakening. “Just before this past New Year’s, she ate about 86 cents in change (without our knowledge),” Shay says. They figured it out when she threw up the coins about 12 hours later. Six of them were pennies. Penny was already acting lethargic, but then she quit drinking or eating and, by the next day, her urine had turned the color of blood. They rushed her to the pet hospital, where they learned that pennies are very toxic when ingested, not only for pets, but for children as well. Pennies minted in or after 1982 are no longer copper, but have only a thin copper coating. They are 95% zinc and stomach acids dissolve the copper coating, leaving the zinc to leach into an animal’s system. Penny survived her second close call because Shay got her to the veterinarian in time. The two-year-old dog spent 48 hours there, getting blood transfusions and fluids. Had her “mom” not been vigilant about her symptoms, Penny would have undoubtedly died from multiple organ failure. Today she is healthy and happy, making this a happy tail, even after her close calls. Now Shay is spreading the word about zinc toxicity by sharing Penny’s story on Petfinder, on HubPages and on YouTube. Zinc toxicity is a problem that all parents need to know.